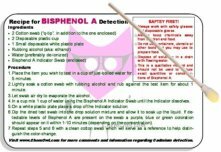 We are happy to offer you our test kits incorporating the specialty indicators required to carry out the detection recipes to detect for hazardous chemicals discussed on "Home Health Chemistry". At a fraction of the cost of commercial test kits, you can choose to follow our detection recipes using specific indicators purchased from us or from any independent chemical supplier – it's your choice! Each type of kit arrives with 5 swabs, on which the amount of indicator required by the recipe is deposited for easy and safe handling. 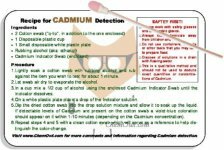 You will also receive the printed test recipe describing how to carry out the screening procedure. Simply place a swab in the appropriate solvent (either water or alcohol as directed by the recipes) to prepare an active solution, with which you may test several items. 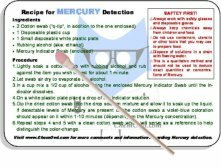 Scroll down and add to your shopping cart any of the following kits that you wish to purchase (all for only $29.99 each including shipping and handling) in order to detect the corresponding hazardous chemical. All financial transactions are handled exclusively by PayPal's secure payment system, and Credit Cards are accepted, so none of your personal financial information is transferred to us or stored by us (see our purchase policy for more information, including shipping and handling charges).